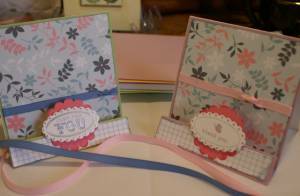 A two fold greeting card is easy to make and looks so interesting! See my easy tutorial for making one here. This kind of card is sometimes called a stair step card, or it could also be known as a variation of an accordion card. All you need to do is start with a longer card front and add another two folds to that, and you will have added a whole new dimension and a whole lot of interest to your handmade salutation. You will see that the choice of designer series paper also makes a huge difference to how interesting this one looks. Here are some of the papercraft tools and supplies I used to make this greeting. I started with some complimentary colours in inks, card stock and designer series paper, found a sentiment stamp that fit within an oval scalloped punch and that could then be layered onto a scalloped circle shape, used my distressing tool to add interest to the strip of paper for the front fold, a bone folder, and there was plenty of double-sided tape and stampin' dimensionals used as well. All supplies used are from Stampin' Up! 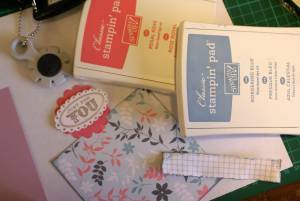 To create the accordion part, make a card blank with a front piece about five centimeters (2") longer than the back. Score and fold at 2 1/2cms (1") and 5cms (2"). 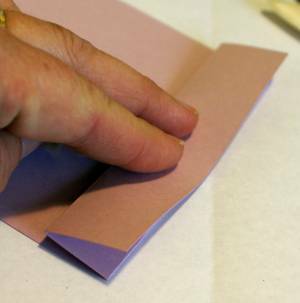 Be sure to fold the first fold as a mountain fold (it sends the fold in the cardstock up towards you) and the second fold as a valley fold (sending the carstock fold down away from you). Crease these folds well with a bone folder. 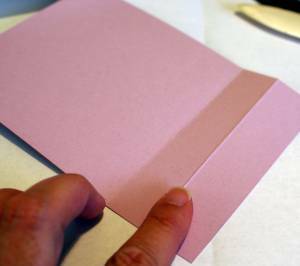 You will want the front of the card to be capable of folding flat, like this, so you can easily place it in an envelope and it will stand up well when unfolded, so crease the folds well and leave them under something heavy for awhile. It helps the fibres of the paper to relax along the scored line when you do this. After you have the basics done, go ahead and decorate your card. I chose to cut a piece of plainer designer series paper for the very front of the card (on the lower fold) and to distress the edges of that with my distressing tool. Then I chose a more decorative piece of designer series paper for the main part of the card and wrapped a ribbon around that. I put stamping dimensionals on my stamped, embossed and punched sentiment and adhered it at a slight angle to the very front of the card. Isn't that a simple way to make an interesting card? Go ahead - make yourself a two fold greeting card today! If you enjoyed this project, you might like to make an explosion card or try out some of the other origami projects available here.